Those looking for proof that new ideas still flourish in Hollywood should skip watching "The Rite," the latest horror film to rely on the age-old cinematic scare tactic of the exorcism. Because if you've seen one exorcism flick, you've really seen them all. Some innocent and unsuspecting victim gets possessed by a demonic spirit, they start speaking in tongues, crawl all over the floor in an awkward, contorted pose resembling the crab walk and soon enough, a mysterious priest is screaming and dousing them in holy water. If you're lucky, the director might even throw in some projectile vomiting for good measure. And while there's no upchucking in "The Rite" (unless you count a coughed up pile of nails), the cliche-ridden plot isn't without a few nausea-inducing moments. Questioning his faith following seminary school, Michael Kovak (Colin O'Donoghue) is sent to Rome to learn the creepy art of exorcism. 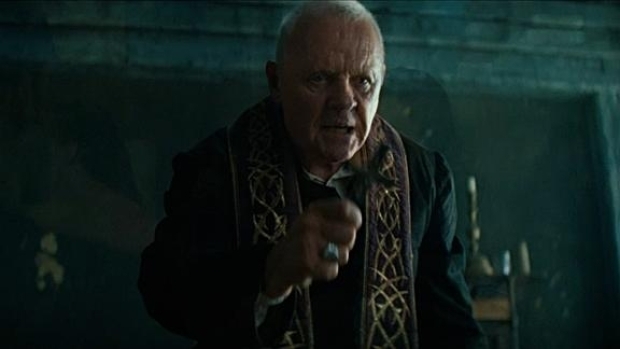 Like any rational human being, he's not sold on the whole possessed thing, so his superiors send him to Father Lucas Trevant (Anthony Hopkins), an exorcist known for his unorthodox techniques. Witnessing a strange series of events, including a pregnant teenager and a maimed school boy, not to mention his own increasingly disturbing visions, Kovak slowly comes around, until -- spoiler alert! -- it's him performing an exorcism. Besides suffering from subject matter that's been done to death, "The Rite" is plagued by poor pacing. The build up to Kovak's transformation moment feels excruciatingly long, while moments intended to frighten are rushed (thanks in a large part to the over compensating soundtrack). It's as if director Mikael Hafstrom is just checking the box. To top it off, Hopkins' prodigious talents are wasted on hokey material that's clearly beneath him. Though considering the thespian's recent track record, all complaints should probably be lobbed at his agent.